How do ZZap Banknote Counters work? 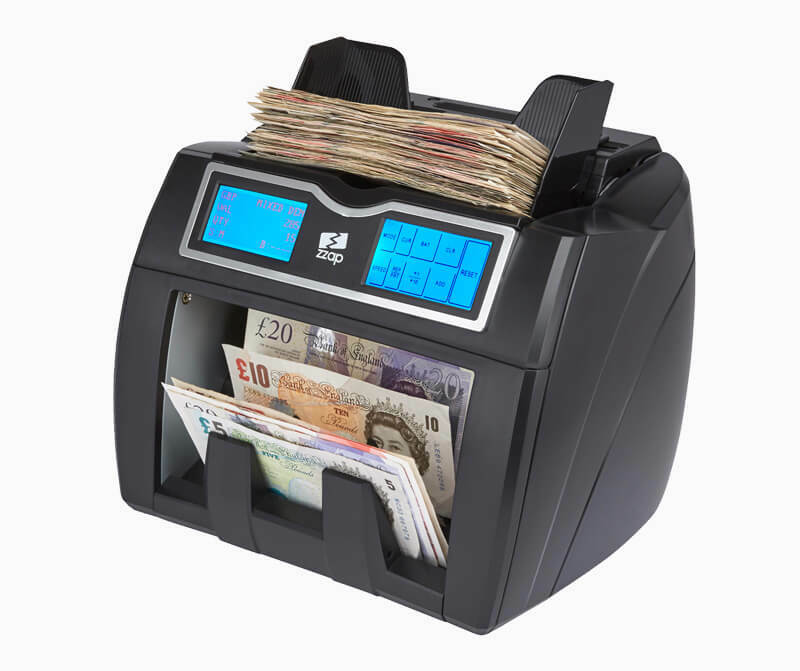 ZZap banknote counters automate your cash handing in order to save you time and money. Banknote counters eliminate human error and can perform various functions such as counterfeit detection, batch counting and sorting. Now lets take a look at how they work. All ZZap banknote counters can count sorted (single denomination) banknotes. 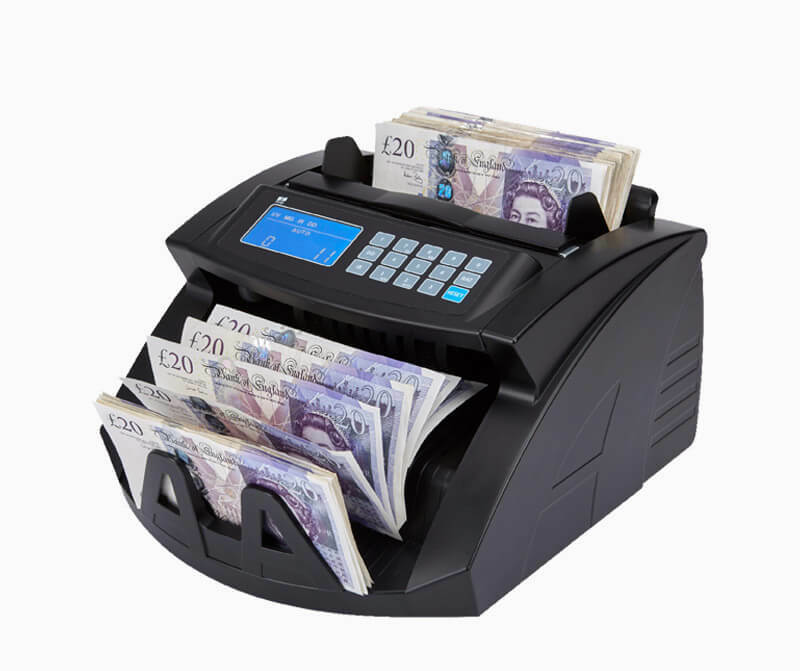 However advanced banknote counters such as the ZZap NC60 recognise different denominations whilst they count. This enables them to count unsorted (mixed denomination) banknotes and report the total value counted as well as the total quantity counted per denomination. Security features are built into currency to prevent forgery. As the banknote passes through the machine, various sensors check if the security features are present. 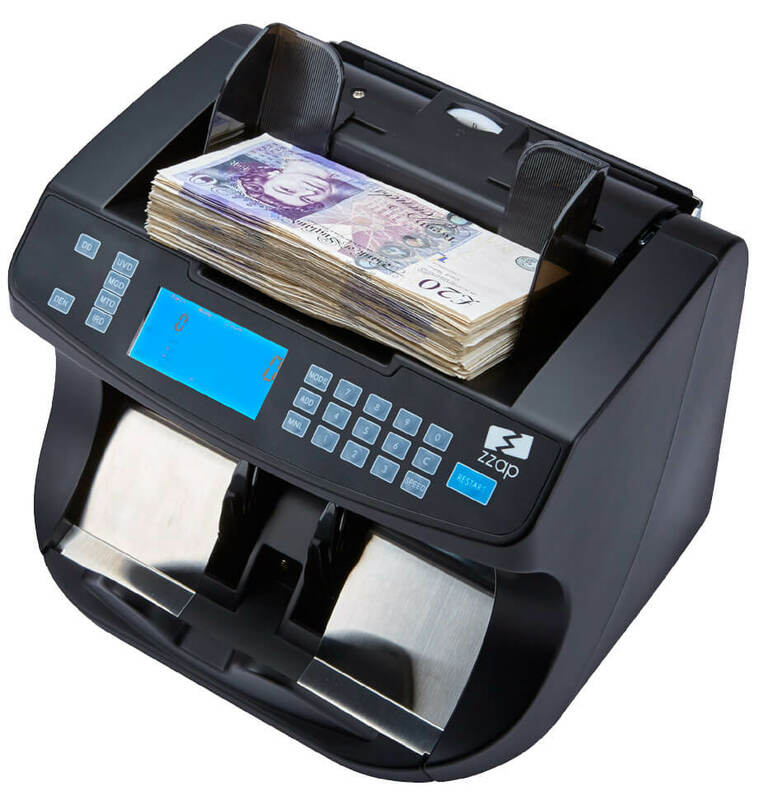 Low specification banknote counters will check for simple security features such as UV marks. High-end banknote counters such as the ZZap NC40, will check more advanced security features such as infrared and metal thread. The more security features that are checked, the more accurate the counterfeit detection will be. See the counterfeit detection page for more information. The hopper is where you place the banknotes. To use a back loading hopper you place the banknotes on the hopper vertically. However to use a top loading hopper you place the banknotes on the hopper horizontally. Top loading hoppers are generally easier to use, have a larger banknote capacity and allow you to add banknotes to the hopper while it runs, for continuous counting. How does a banknote counter count banknotes? 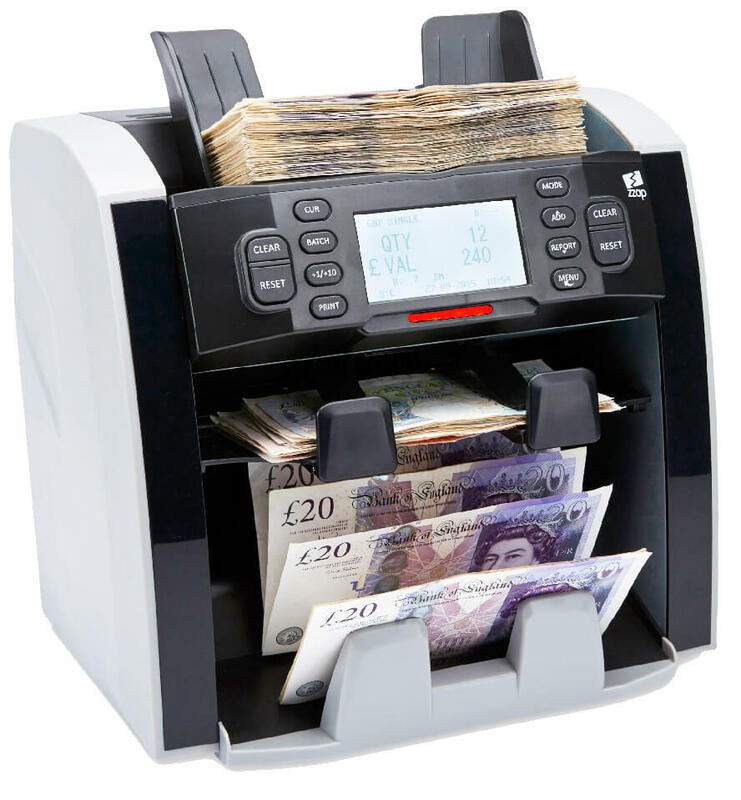 When banknotes are placed on the hopper, the start/stop sensor detects the banknotes and activates the feed-in roller. As the roller rotates, it feeds the bottom banknote on the hopper to a second roller rotating at a faster speed. Low-friction flanges on the second roller ensure only one banknote gets fed in at a time. At this point, various sensors verify and count the banknote. The banknote then travels into the stacker impeller and falls neatly into the stacker. At one end of the spectrum, there are banknote counters that simply count the quantity of sorted (single denomination) banknotes. More sophisticated banknote counters count at faster speeds and use features such as batch counting. At the far end of the spectrum you have advanced banknote counters that count and sort unsorted (mixed denomination) banknotes and detect counterfeits with 100% accuracy. Sometimes a different denomination (or rogue denomination) is mistakenly put within a stack of sorted (single denomination) banknotes. 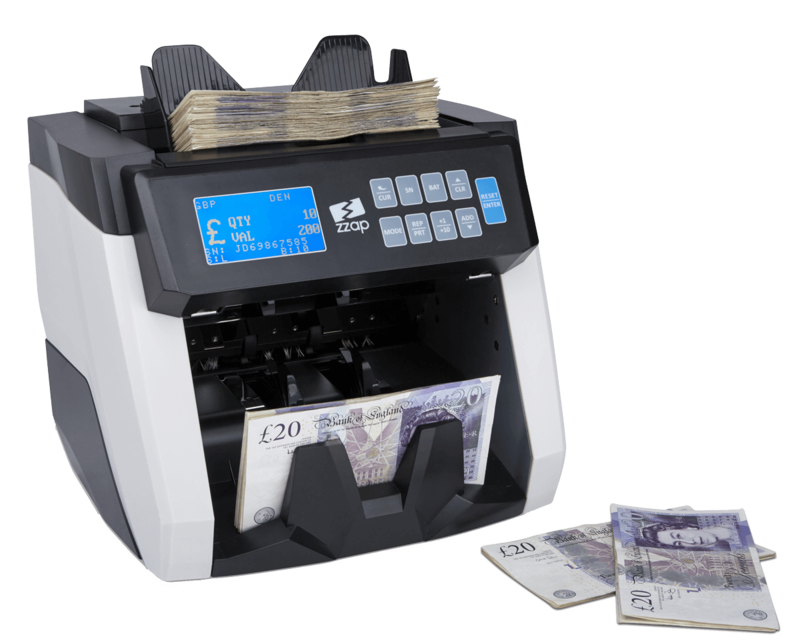 Fortunately banknote counters such as the ZZap NC20 recognise the size of each banknote. Every denomination has a different size (except US dollar) therefore if a different denomination is counted the ZZap NC20 will pause counting and alert you with a visual and audio warning. 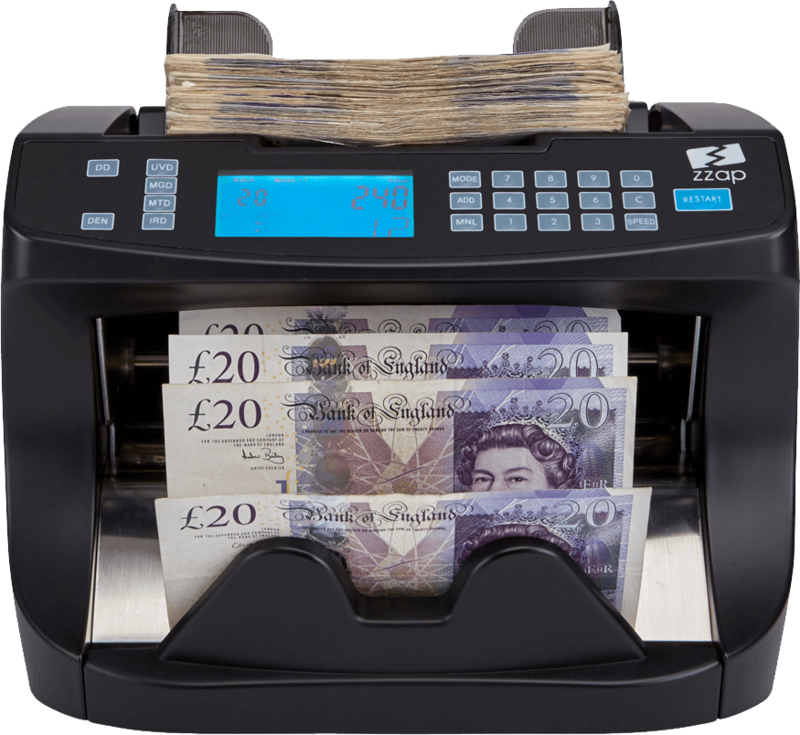 High specification banknote counters such as the ZZap NC70 use advanced contact image sensors (CIS) that enable them to scan an image of the banknote. This allows them to sort the banknotes according to denomination, face and orientation. 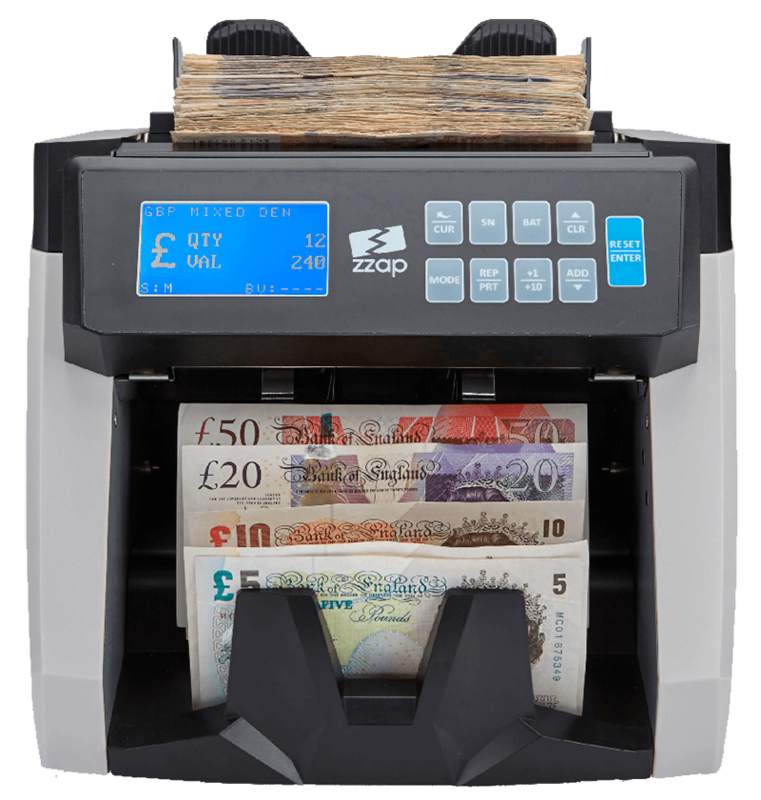 The ZZap NC70 also uses 2 stackers, so it can sort banknotes without stopping.